The Government is charting a new course for blue planning in Kiribati – together with key stakeholders who have operations or interests in the marine environment of Kiritimati Island, including the private sector and communities. Jointly, these stakeholders have identified more than 40 different uses of the marine environment, ranging from bone and giant trevally sports fishing, diving, snorkeling, bird watching, island tour, fishing for aquarium trade, long and pristine beaches, natural salt production in the ponds, manta ray and dolphin aggregation, closed areas for conservation, etc. While remarkable on its own, these uses and services provide a large economic value to Kiritimati, and Kiribati as a whole. 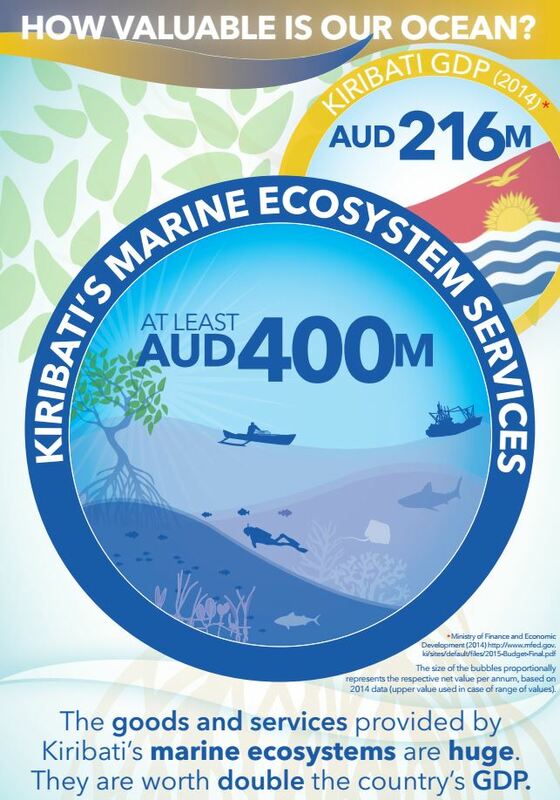 The estimated economic value of national marine ecosystem services amounts to AUD$ 400 Million (2014 baseline study), with marine tourism at around AUD$4.3 million per year. 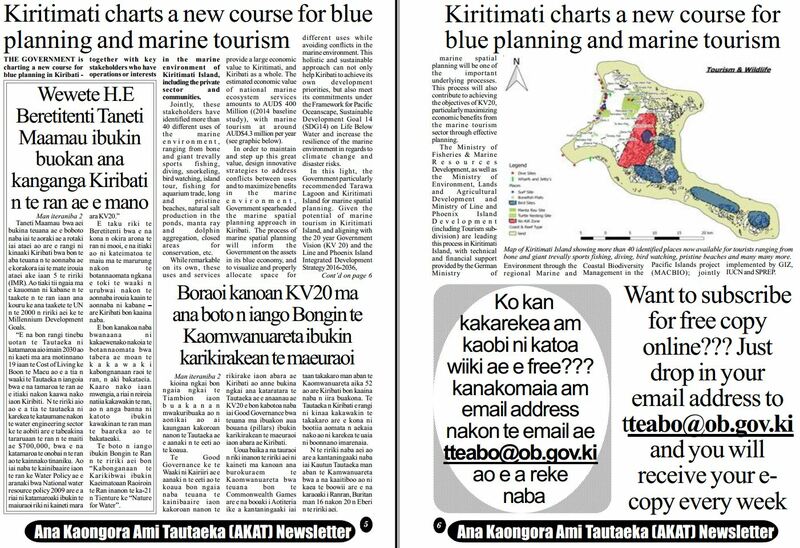 In order to maintain and step up this great value, design innovative strategies to address conflicts between uses and to maximize benefits in the marine environment, Government spearheads the marine spatial planning approach in Kiribati. The process of marine spatial planning will inform the Government on the assets in its blue economy, and to visualize and properly allocate space for different uses while avoiding conflicts in the marine environment. This holistic and sustainable approach can not only help Kiribati to achieve its own development priorities, but also meet its commitments under the Framework for Pacific Oceanscape, Sustainable Development Goal 14 (SDG14) on Life Below Water and increase the resilience of the marine environment in regards to climate change and disaster risks. In this light, the Government particularly recommended Tarawa Lagoon and Kiritimati Island for marine spatial planning. 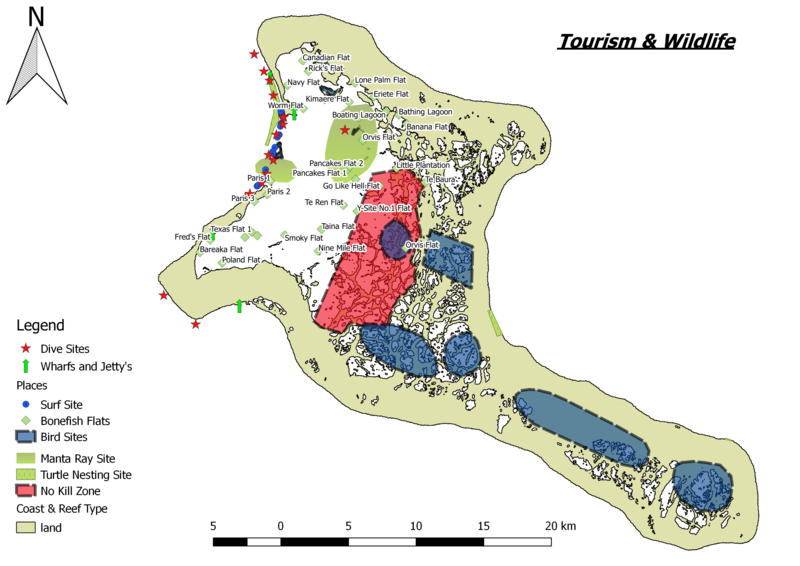 Given the potential of marine tourism in Kiritimati Island, and aligning with the 20 year Government Vision (KV 20) and the Line and Phoenix Island Integrated Development Strategy 2016-2036, marine spatial planning will be one of the important underlying processes. This process will also contribute to achieving the objectives of KV20, particularly maximizing economic benefits from the marine tourism sector through effective planning. The Ministry of Fisheries & Marine Resources Development, as well as the Ministry of Environment, Lands and Agricultural Development and Ministry of Line and Phoenix Island Development (including Tourism sub-division) are leading this process in Kiritimati Island, with technical and financial support provided by the German Ministry of Environment through the regional Marine and Coastal Biodiversity Management in the Pacific Islands project (MACBIO), jointly implemented by GIZ, IUCN and SPREP.